In the relatively small pickup truck segment, the Chevrolet Silverado has been a strong competitor ever since it first hit American roadways back in 1999. The Silverado has seen its way through a few different generations, and has arrived in 2016 with a new look, features, amenities, and power offerings. At a time when one of the most competitive segments in the automotive industry has started to go stale, the 2016 Chevy Silverado not only got a new face, but is also a strong contender for Motor Trend’s coveted “Truck of the Year” award. The Chevy Silverado is known for being the longest lasting full-size pickup trucks on the road, but that honor did not stop Chevrolet engineers from taking the iconic pickup, and making it even better. Improving upon the best selling and longest lasting pickup in America was not easy, but Chevrolet managed to deliver an even stronger version of the Silverado for 2016. With an all new modern look, restyled interior, and performance upgrades – the 2016 Chevy Silverado is everything you need to be, and MORE. The best place to start when talking about a new beginning for a vehicle, is, the beginning. The first place anyone sees when checking out a vehicle, is the exterior. The new Silverado is striking in its modern appearance, which features signature LED lights that are styled to reflect the next generation of vehicles. In fact, Chevrolet redesigned the entire front end of the 2016 Chevy Silverado, sculpting it to reflect the updated grille design. Each one of the 2016 Silverado trim levels displays its own unique version of a front grille, from black inserts, to chrome accents, to a horizontal styling approach. Every Silverado model is unique in the way that it is presented to the world first, with it’s front bumper. The new styling means a more muscular look, and let’s face it – there is no such thing as a pickup truck with too much muscle. The revised exterior of the 2016 Chevy Silverado is without a doubt, very exciting. But what may be even more of a thrill is the new performance upgrades that the iconic pickup has received. General Motors is kicking the older six-speed transmission that was used in the 2015 Silverado, and incorporating its highly responsive 8-speed Hydra-Matic 8L90 automatic transmission. Designed to more confidently handle large loads when towing and hauling, the Hydra-Matic transmission is the thing truck drivers dream about. The rear axle gear ratios are lower in number, which improves fuel efficiency by reducing the RPM of the engine. The result? A smoother, more powerful ride – whether you are carrying a cabin full of passengers, or trailering a full-capacity tow load. The new 2016 Silverado has you covered. The engine is the heart and soul of every vehicle on the road, but this sentiment rings even more true for pickup trucks. A vehicle whose sole purpose is to perform tasks with efficiency and power, needs to have a strong heart to pump blood through its veins. The 2016 Silverado has the option of three different EcoTec3 engines to choose from. The standard 4.3-liver V6 engine produces an impressive 285 horsepower and 305 lb.-ft. of torque, which just so happens to be the highest of any standard V6 engine on the market. The second option is a more powerful 5.3-liter V8 engine, with 355 horsepower and 383 lb.-ft. of torque. The third, and most powerful option, is the large and in-charge 6.2-liter V8. This powerhouse of an engine makes a whopping 420 horsepower, 460 lb-ft. of torque, and can tow a jaw-dropping 12,000 pounds. Those numbers are impressive on their own, but even more so when they are shown to be the highest of ANY light-duty pickup on the road today. For drivers who value in-vehicle technology, the 2016 Chevy Silverado does not disappoint. Featuring the latest version of Chevrolet’s MyLink infotainment system, the intuitive touch-screen control center supports both Apple CarPlay, and Android Auto. Drivers can more confidently navigate the terrain and road ahead, without taking their eyes off the road, or hands off the wheel, to make important calls or send messages. Other amenities that have been added for the latest Silverado model include a wireless phone charging system, available 4G LTE Wi-Fi hotspot connectivity, a remote locking tailgate, power articulating running boards, and more. As far as safety in concerned, Chevrolet pulled out all the stops. Forward Collision Alert, IntelliBeam high-beam assist lights, and Lane Keep Assist, have all been added to the lineup for the first time. The 2016 Chevy Silverado is an impressive pickup on its own, but the new concept that Chevrolet showed off at the 2015 SEMA Show, is beyond words. 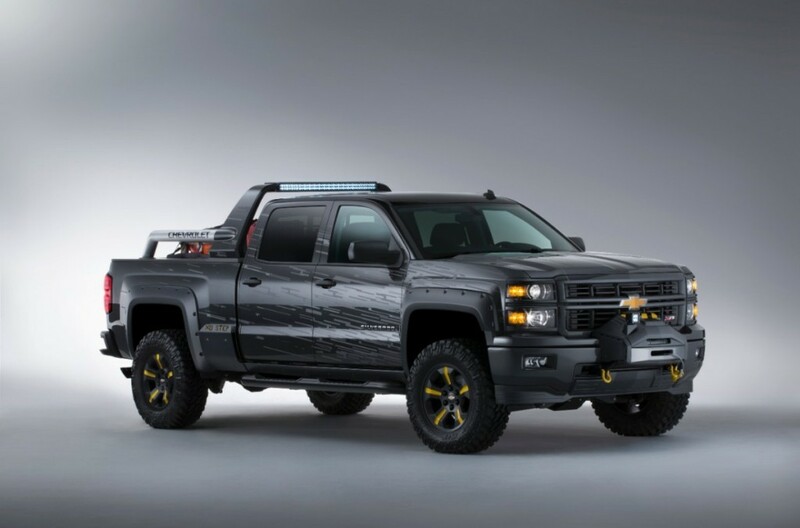 The Special Ops edition Silverado is a concept based on the Z71 trim level. Featuring the newly styled front end of the 2016 Silverado, the Special Ops version is decked out in Navy camo paint that was designed over 100 years ago to help camouflage Navy ships at sea. Completely unique to the Special Ops version of the Silverado, are the bed-mounted sport bar with LED lighting, wheel flares, off-road tires, a bed-mounted utility rack, custom rocker guards, waterproof seat covers, and more. Performance enhancements include updated brakes, an exhaust system, and an air intake system. There is no word on whether this concept will even hit dealer showrooms, but we are guessing that the widespread appeal will help ensure that this unique 2016 Chevy Silverado will be an absolute success. The Chevy Silverado is a true legacy in the pickup truck world, and the latest version is no exception. With more strength, greater reliability, and the most advanced technology available – the 2016 Chevy Silverado is a must-have for every pickup truck enthusiast in America.